AMERICAN BEECH , Fagus grandifolia, about 110 years old, with a column of compartmentalized, decayed wood associated with an old, dead branch. 1. Beech has diffuse-porous wood. All vessels are about the same size and arranged evenly throughout the growth increment. Beech will tolerate low light and often it will grow very slowly, as shown here, as an understory tree. When it is released into light, it grows rapidly. 2. A small wound with decay was compartmentalized in the center of the tree. 3. The tree lost branches at this time and a core of protection wood formed. This type of protection wood is called false heartwood, because the death of branches triggers the process. Heartwood formation in oaks is a genetically controlled aging process. The false heartwood, like heartwood, resists the spread of decay. 4. Note that the decay associated with the dead branch did not spread into the column of false heartwood. It could be that the events that brought about the formation of false heartwood--dying branches--also released the tree into more light. Note that after a few years, the growth increments increased greatly in width. 5. The cellulose and lignin were both being digested, indicating a white rot. The fungi did not grow into the central core of dense, slow growing, false heartwood. 6. Note that the decay spreads first into the earlywood of each growth increment. This pattern results in a tooth-like margin to the column of defect when viewed in cross section. 7. The decay associated with the branch did not spread outward into the column of discolored wood. 8. 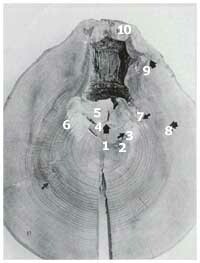 The limits for the column of discolored wood were set by the cracks that formed as the woundwood closed the wound. 9. A crack where the woundwood formed about the dead branch. 10. The curling woundwood ribs formed ram's horns. The cracks that form in this way often extend the columns of discolored and decayed wood beyond the barrier zone and wood present at the time of branch death or of wounding.